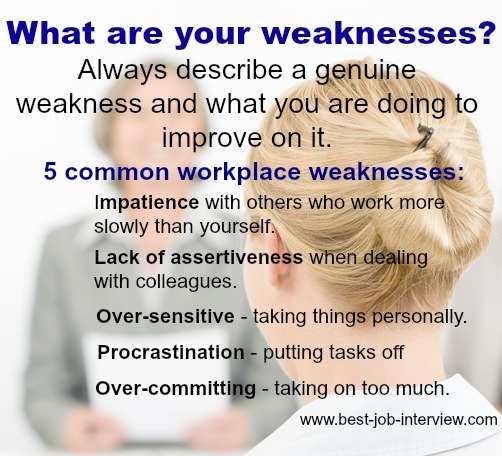 Interview questions weaknesses help and advice. 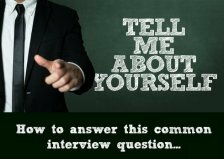 How you respond to the job interview weaknesses question says a great deal about you and that's why it's been around so long. These are actually the qualities the interviewer is assessing, not the actual weakness itself. 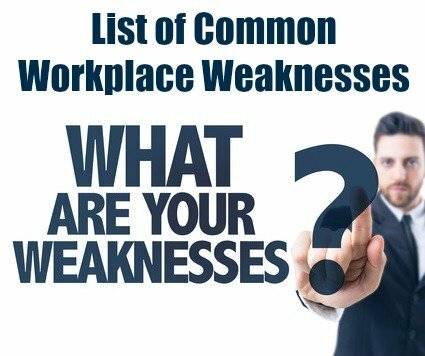 Go through this list of weaknesses as they present in the workplace and decide which applies to you - everyone has a weakness or two! Look at the suggestions on how you can improve on your weakness. Develop a constructive interview answer that acknowledges the weakness and then goes on to describe what you are doing to improve on it and what appropriate behaviors you use to compensate for it. Misses deadlines, rushing at the last minute to complete tasks, needing help to complete tasks, unprepared for meetings, low productivity. Recognize the cause of the procrastination. If it is because a task seems too overwhelming then break it into smaller, more manageable activities and set deadlines for completing each activity. If it is because you lack confidence in your ability to do the task then ask for help and find resources to assist you. Frustration with others who perform at a slower pace or to a lower standard than you expect of yourself. Doesn't accept mistakes easily. Recognize people have different work standards and different levels of productivity. See it from their point of view. Provide constructive feedback in a pleasant way and offer help to move the project forward. Doesn't assign tasks to others, lacks confidence in co-workers, doesn't fully utilize other staff members, checks up on others. Admit that others can do the work as well as you. Accept that mistakes may be made but they can be corrected. Learn to trust other's abilities. Clarify what has to be done. Put support mechanisms in place to minimize the chance of failure. Reluctant to speak up and contribute in group situations. Agrees with others despite own feelings. Allows others to take advantage. Difficulty in saying "no". Puts other's needs ahead of own. Read books and undertake training courses on how to be assertive. Practice suggested techniques. Practice strategies for saying no to unreasonable demands. Practice making requests and asking for what you need. Use assertive body language to get your message across. Adverse to taking risks and trying new things, difficulty in accepting change, continually reviews all details before making a decision or starting on a task. Over-analyzes outcomes. Practice increasing pace of communication and activity. Be open to new ideas. Avoid over-attending to details and focus on the big picture. Learn to trust other people's judgment. Set yourself specific time frames for reviewing information and getting started on a project. Inflexible, difficulty in adapting to changes, resistant to different ideas, one way communication. Be open to different ideas and listen to opinions that conflict with your own. Take time to consider an idea or change and not just immediately dismiss it. Actively ask for people's contributions and feedback. Single minded on own goal achievement, does not take direction easily, can be insensitive to feelings and needs of others, wants to be in charge. Tries to control other people's activities. Increase self awareness of how one is perceived by other staff members. Actively listen when given feedback and direction. Focus on building relationships as well as task achievement. Consider other people's needs. Distracting and distracted, indiscreet, does not get the job done, wastes time, often away from desk. Stay at desk and do not move around office unnecessarily, have a specific work-related purpose for going over to a co-worker, set aside a specific time to chat with co-workers such as lunch break, stick to the facts when communicating and do not get off the point, learn to listen more. How to answer "What are your weaknesses?" When disclosing job interview weaknesses avoid focusing on something that is a core competency for the job. Rather describe general behaviors that impact on a number of areas of your life - personal, home and work. "My family tell me I am impatient. I acknowledge this is a weakness of mine at home and sometimes in the workplace - I like things to be done promptly and in the way I regard as best. When that doesn't happen I get frustrated. I am making a conscious attempt to see it from the other person's point of view, recognize that people approach things differently and not impose my own methods and expectations on others. I find if I provide constructive help rather than getting impatient it improves the situation." This answer provides honest feedback while positively highlighting that you are a results-driven person. Go here to view a comprehensive list of strengths that can be used to successfully answer this interview question. 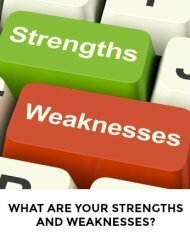 For free interview answers to the interview question What are Your Strengths and Weaknesses? Be aware of your interview body language when answering questions about your weaknesses. 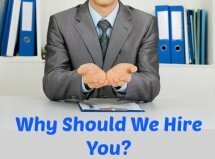 Whys should we hire you? Use the interview questions weaknesses list to prepare a well considered and appropriate interview answer to the question "What are your weaknesses?"